Roasted Chicken with Potatoes flavored with garlic and olive oil is always a family favorite. Juicy and tender chicken thighs are baked with potatoes and other veggies you have on hand with no fuss. This is an easy go-to dinner recipe that you can make on busy weekdays. This post was originally published in 2012 and we are updating it today with additional information and new pictures. You can never go wrong with chicken recipes with potatoes. It is easy to satisfy everyone when you have these two in a recipe; that’s why you are not limited to one season to make something with these two. Just like our One Pan Garlic Lemon Chicken Wings with Bulgur, this Roasted Chicken with Potatoes is a recipe that we can make all year round. It was winter time when I first shared this recipe with you 5 years ago. Our favorite chicken recipe in winter is Tomato Chicken Rice Soup, which is super healthy, packed with flavors and can be served as dinner on its own. That said, we love to make baked chicken with potatoes especially when we want to eat chicken in portions. Nobody but my son feels like having a comforting soup when the temperature is high outside, I know. Another thing I’m sure about is that everyone licks their plate when they are served Roasted Chicken with Potatoes no matter what the temperature outside is. I don’t remember how many times I’ve made this, but it’s always a big hit. I use either boneless chicken thighs or drumsticks in this recipe. As for the vegetables, potatoes are staple for me. Also, I add the leftover veggies we have in the fridge. Summer tomatoes and red bell peppers go well too if they are in season. Put everything in a casserole pan, drizzle a generous amount olive oil and bake at 400F for 50 minutes or until chicken is tender. I bake everything together and never have a problem. The only thing I can warn you about is the chopped size of the potatoes you use. Don’t chop them very thinly to prevent them from being mashed. Make thick slices of potatoes (about 1 inch) so that they are cooked at the same time. Just halving them would be enough if you are using baby potatoes. If you are using other vegetables, consider their cooking time before slicing them. When you use a whole chicken though, you will probably need more baking time. Check the tenderness of potatoes after 50 minutes, remove them if they are done and bake the chicken for an extra 20-30 minutes. 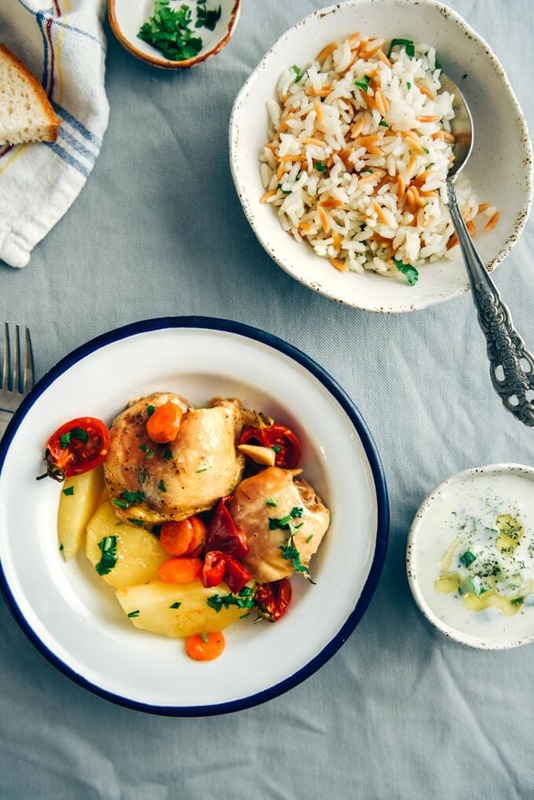 We love to pair this scrumptious meal with rice with orzo or cheesy zucchini rice and Turkish yogurt and cucumber dip aka cacik, which is very similar to Greek tzatziki. If you prefer to serve it with a refreshing salad as it’s summer time now, Mary’s Memphis Style Coleslaw Recipe and Rebecca’s Cucumber Scallion Salad would be perfect match. Below are the pictures from the original post that was published in winter time. Oh and if you make this Roasted Chicken with Potatoes, I’d love to hear your feedback. Please rate the recipe and leave a comment below. 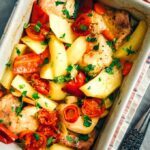 Juicy and tender chicken thighs are baked with potatoes and other veggies you have on hand with no fuss. 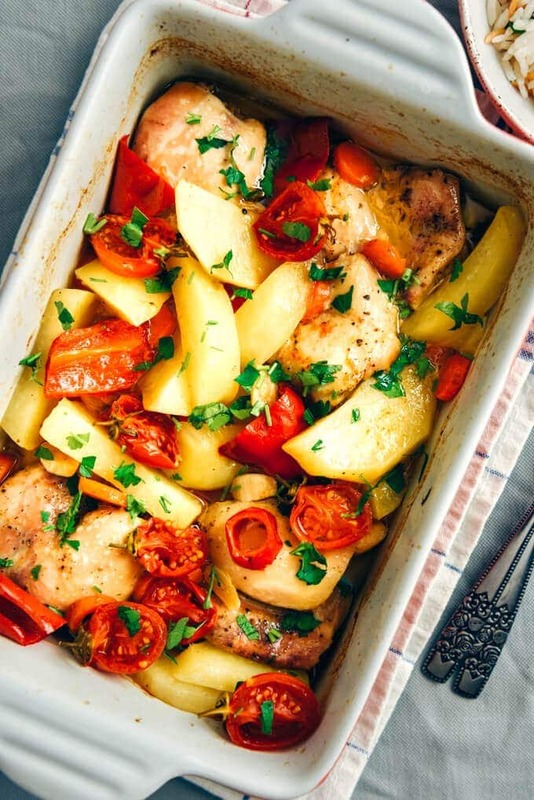 Place chicken thighs, potatoes, carrots, red bell pepper and tomatoes in a large bowl. Add in 3 tbsp olive oil, lemon juice and water. Give them a good stir either with a spatula or with your hand. Transfer chicken thighs first into a baking dish. Then add vegetables on and around the thighs and pour any remained sauce over them. Cover it with aluminium foil. Roast in oven for 50 minutes. Sprinkle parsley over it when serving. What beautiful pictures of the snow. I am fascinated by the recipes too, they all look so delicious. Most of all I am fascinated by the picture of yourself. This is really cool. I know nothing about Turkey. The only Turkish women I have met in Texas were dressed like Catholic nuns. Suits with long skirts and a short veil to match. I formed the idea that all people in Turkey, both men and women, wear suits and are very serious. No one I know in Texas knows anything about Turkey or any of the countries in that part of the world. They don’t really tell you anything in school. The magazine and news articles emphasize armed conflict in any articles they print about other countries. They make the entire world seem sad and scary. People around the world must think Americans are stupid and they are not far wrong. But the best remedy for this is sites like yours that tell about the everyday good things that we all share, all over the world. Everyday people are not enemies. It’s wrong for the people in the governments to start these wars and they do it by keeping people in ignorance and making people scared. The American news media is the worst worst worst about that. It is controlled by a few very powerful corporations. We can go around this by talking directly to each other online about food and the good things we all hold in common. Hi Lorna, thanks for this sincere comment and glad to hear that you like my blog. People outside Turkey might have prejudice about my country as they don’t know much about it. Some even think that we ride camels here 🙂 It may be because Turkey is not a big country or as you mention, media and their owners could be blamed for this. Well, I started my blog with these thoughts 4 years ago, so at Give Recipe I’m trying to tell about my country, along with its food and culture. Nice to ‘meet’ you here! Beautiful comfort food for the cold weather…love the photos! What a great dish for the cold weather! It snowed for the first time this winter in London yesterday and so today I’ve woken up with lots of snow on the ground. It looks pretty but I’m planning to stay inside in the warmth all day and maybe cook something nice later on. How great! And those winter shots are so perfect!